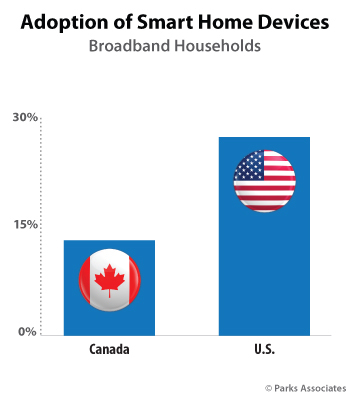 International IoT research firm Parks Associates released new research today showing 12% of broadband households in Canada have a smart home device such as a smart thermostat, smart door look, or video doorbell, compared to 26% in the U.S. According to Smart Home and Security in Canada, the security market in Canada is starting to leverage these solutions to drive new growth in their market. In Canada, 25% of broadband households have an active home security system, 70% of which have professional monitoring, and 25% of professionally monitored households plan to switch providers over the next year. Parks Associates reveals that networked cameras, smart door locks, and products such as video doorbells are increasingly part of provider options in Canada. The provider goals include increasing retention and expanding the base of households seeking fee-based monitoring. Smart Home and Security in Canada indicates voice control options could also drive consumer interest in IoT innovations. 11% of security system owners acquired their system within the past 12 months, a decline from 17% two years ago. 18% of all broadband households have at least basic interactivity with their security system.